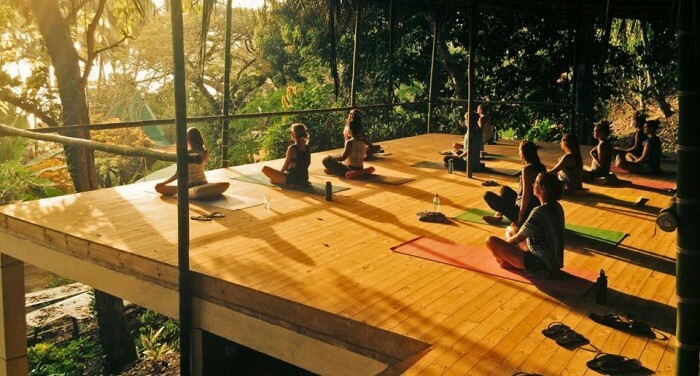 Buddhi Retreats is an all-inclusive yoga and surf retreat, situated in Costa Rica. This retreat is perfect for those who are seeking a place for escaping from the day to day life and enjoy submerging in the breathtaking and calming nature. This retreat center create a healthy, active, positive and receptive vibe with small groups of guests. While staying at this center, you will enjoy yoga, surfing and mindful coaching and activities that will make you more aware of yourself and your act and behavior. This retreat is ideally designed for 12 people max, so it is recommended to make a reservation. This retreat is held at the Rancho Burica that is located close to the well known surf spot Pavones and just nestled at the end of the road in Punta Banco, on the beach. Nestled between the rainforest and the Pacific, in the southern side of the country, it is an amazing jungle hideaway. At this place you will enjoy peace, hospitality, quietness and also the natural beauty of the surroundings. • Shared accommodation perfectly designed for 2 to 3 people but if any one want to enjoy more privacy, they can ask for a private room. • You will also get healthy snacks and drinks. This retreat also include some activities to choose from. You an join the surf and ‘connect with nature’ session. Whether you are a beginner or advanced surfer, you will get the opportunity to enjoy surfing in the ideal surfing destination. You can take care of your physical and psychological health by taking the fourteen yoga session that lasts for one hour and fifteen minutes and half of the time is based on Yin yoga and the other half focuses on Ashtanga Yoga. You will also enjoy mindfulness practice that includes silent meals, personal coaching, silent walks and many more. Adventure lovers can enjoy hiking into the jungle hills or over the beach. You can also go for other activities including horseback riding through the indiginous reserve or can go for reef-fishing with help of a local fisherman. If you wish, you can also go for bike riding or just get relaxed by taking hour-long full body massage. During the retreat you will enjoy a daily active and slower yoga practice with an optional guided meditation. These workouts will allow you to slow down and become connected with your inner self as well as become aware of your body, mind, breath and soul. Yoga classes are directed by the yoga teacher Hanneke Megens who combines Eastern wisdom with ancient Indian yoga traditions. She will guide you to learn the soft and strong yoga poses and to unite your body, mind and soul.